We are Manufacturer, Supplier & Exporter of Hammer Mills and our setup is situated in Miraj, Sangli, Maharashtra, India. We have two types of Hammer Mills Full sieve / full screen Hammer Mill ( Grinder ) & Half Sieve Hammer mills used for crushing purpose. These Hammer Mills widely used in Feed Sector, Organic Fertilizer Sector for crushing the raw material to desired size even these are used in Bio mass, food industries, pharmaceutical etc. 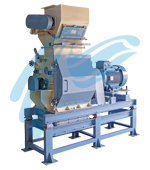 Air Blown Hammer Mill (Cyclogrind) is used for Fine Maize or other grains Crushing ( Maize Chuni ). In organic Fertilizer hammer mills used for crushing of Neem ( Indian lilac ), Pongamia Pinnata (Karanji) Seeds. 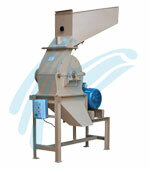 Our Hammer mills are designed robust, long lasting, user friendly.